Radio Canyon is an adware application that will spam you with annoying commercial advertisements. If you are a security-minded computer user, you will make sure that Radio Canyon disappears from your system immediately. There is no need to panic if you see this application installed on your PC. Radio Canyon is not a malicious computer virus. However, adware programs are often related to dangerous third parties, and they could leak your personally non-identifiable data for online marketing purposes. Thus, the sooner you remove Radio Canyon from the system, the better. Radio Canyon comes from the same group of adware applications as Lyrics family adware, TornTV and PlusHD browser extensions. They are all based on Crossrider engine, and they get distributed bundled with freeware. It means that you cannot download Radio Canyon directly. It also implies that if you have this application on your computer, there is a good chance there are more unwanted and potentially dangerous programs on board. If you want to protect your computer from harm, you have to refrain from downloading software from unfamiliar websites. If you must have a new application, download it from the official vendor’s website only. Radio Canyon is compatible with Internet Explorer and Mozilla Firefox web browsers. When it enters your computer, it also adds extensions to the aforementioned browsers and starts collecting information on your web browsing habits. It does not take long before Radio Canyon starts displaying banner ads and pop-ups in all websites that you visit. On top of that, if you access a commercial website, Radio Canyon will display various shopping suggestions in the form of coupon ads. Our security researchers say that Radio Canyon can have many different versions, but it is still practically the same application. The versions differ because they have different numbers attached to the program’s name, for example, Radio Canyon 1.1, Radio Canyon 2.5 or Radio Canyon 6.0. However, just as it has been mentioned, virtually it refers to the same program. The bottom line is that if you want to avoid serious computer issues, you need to delete Radio Canyon immediately. Follow the manual removal instructions below and then scan the PC with a reliable antispyware tool in search for other unwanted applications. Terminate all the unnecessary programs and get yourself a powerful computer security tool to safeguard the PC against similar intruders in the future. Open Uninstall a program and remove Radio Canyon. 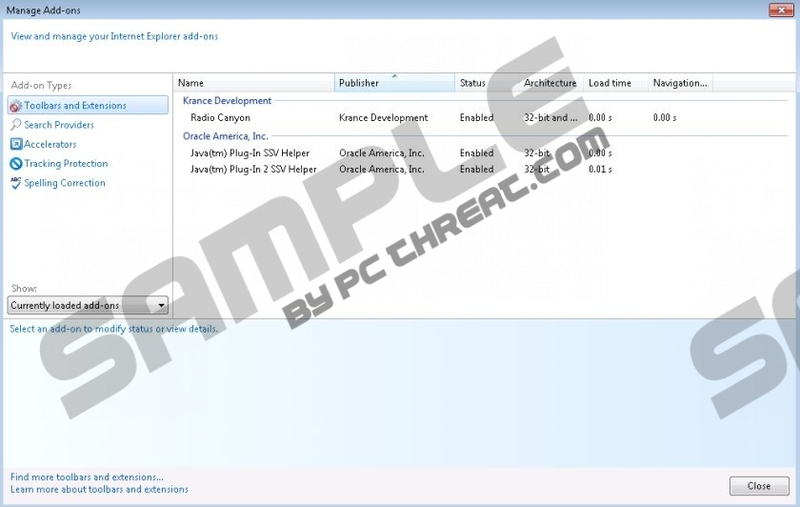 Select Add or remove programs and uninstall Radio Canyon. Quick & tested solution for Radio Canyon removal.